I'm at work but I read on facebook Steve Lamaque was going to be the first person to play the new single by The Specials this lunchtime. Has anyone heard it? Was it good? The track I most want to hear is their new version of Lunatics. But I'm keen to hear 'Vote For Me' too. It is bad need of Neville's vocals. And if my ears don't device me that intro owes a lot to Ghost Town. I do hear the Ghost Town link - that 'devil's chord' - actually reminded me of Never Ask Twice, where Madness nod to Ghost Town. Anybody know if there is going to be a vinyl single of this, or a cd single ?, or is it just going to be a few one track promo cds that go for silly money on ebay ? Took a few listens but I really like it. Very cool and assured vibe. Great teaser for the LP. Only negative I can see is that at 5 minutes long it may not get the radio plays. I'm feeling the opposite. The more times I listen to it the less I like it. It is certainly not as bad as I thought it would be, it has some great parts all of which hark back the Dammers’ days, but to me it just trods along. There is something very synthetic and clinical about the production. I think the album will tell a better tale. I like the recent photos of Terry, Lynval and Horace (I wish they'd used them on the cover instead having a plain grey sleeve). I think on this record Horace is the man of the match and it's his bass playing which is probably the best thing about it. As a song I think that back in the day 'Vote For Me' would have been a b-side rather than a single. It's not as good as any of the songs on Specials, More Specials, In The Studio or Virgins & Philistines. It reminds me of tracks from Terry's Vegas albums like Wise Guy (crossed with the polished, excellent musicianship of Pama International collaborations that Horace and Lynval were involved with). I'm 100 % sure the album will get enthusiastic reviews and that Ian Harrison will continue to write a sympathetic article about them in Mojo/Uncut etc. And I'm sure when they play it live they'll do some sort of medley with Ghost Town and have fun with it. I think Trojan is right about the record needing a contribution from Nev. There used to be a TV show called Whose Line Is It Anyway where a pianist asked members of the audience to show out a musical style or genre which he would then do. 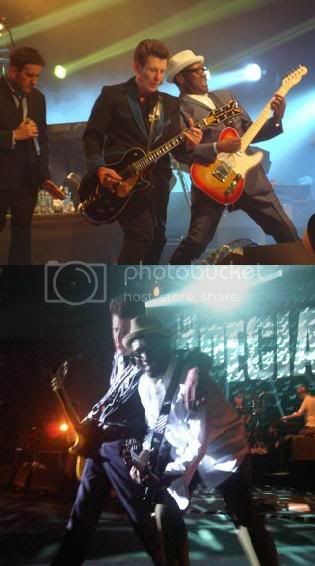 I think it's relatively easy to say to a musician can you re-create this kind of drum roll, play the piano a bit like Mike Barson etc but it's actually incredibly hard to find a Nev Staple as he has an edge or authenticity or toughness about him which you don't often come across and it helped make The Specials specials. It is better than I was expecting, but wouldn't consider it to be worthy of being a single, more of an album track. If this was from a Specials album from back in the day - I would put it on 'In The Studio' which ironically of course did not feature any of the three remaining original members on this track, but did of course feature Jerry. There is a certain irony in the fact that Jerry Dammers had nothnng to do with it but the track has certain elements which have his name written all over them i.e. the jazzy style piano and the extended trombone section. I have seen a few people asking that on Facebook, but there have been no replies. I would love an official release, rather than seeing a small number of promos selling on eBay at ridiculous rates. 'Low key' sums up the release, in more ways than one. Even though I wouldn't have expected an all-singing, all-dancing promotional campaign, a video would have been nice. Even if it was a slide show or animation depicting the song. Does anyone know what the 'Rockaway Beach' reference means? I know it's a Ramones song title, but that's about it. It might be linked to Donald Trump. I think there was a pro-Trump rally that got rowdy in Rockaway. I really like it. ... I wasn't sure what to expect yet after only one listen I found myself humming it in the shower!! Had another listen yesterday and in my opinion its got a kind of lounge bar ska sound to it... I'm not sure it needed the trombone but it works... definitely an echo of Ghost Town but a good tune on its own. Well done The Specials .... or what's left. Heard it on Monday on Steve Lamacqs show. I have to say I was not at all impressed when I first heard it. Ive listened to it about twice a day since. Its a definite grower.